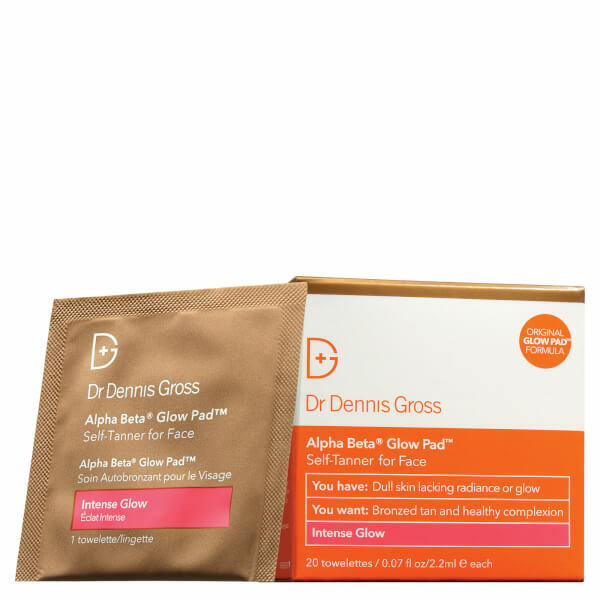 Achieve a sun-kissed complexion with the Alpha Beta Glow Pad - Intense Glow from Dr Dennis Gross. Infused with Alpha and Beta Hydroxy Acids, the exfoliating self-tanner face pads buff away dead skin cells and decongest clogged pores, revealing a smoother, more refined appearance. Packed with antioxidants for multiple anti-ageing benefits, the pre-soaked towelettes utilise encapsulated DHA and Vitamin D to deliver time-released colour that develops gradually to create a natural-looking, streak-free tan. Easy to use, you can expect a glowing complexion with improved texture, tone and radiance. Suitable for all skin types. Apply pad to clean, dry skin in circular motions wherever colour is desired and colour will gradually appear within 3 hours. Increase the number of repetitions to enhance the pigment’s intensity. Use on face, neck, and décolleté, blending evenly morning or night. Wash hands immediately after use. Water (Aqua), Ethoxydiglycol, Dihydroxyacetone, Glycerin, Glycolic Acid, Lactic Acid, Retinyl Palmitate, Panthenol, Ascorbyl Palmitate, Ergocalciferol (Vitamin D), Tocopheryl Acetate, Salix Alba (Willow) Bark Extract, Hydrolyzed Soy Protein, Phospholipids, Phyllanthus Emblica Fruit Extract, Erythrulose, Phytic Acid, Disodium EDTA, Phenoxyethanol.